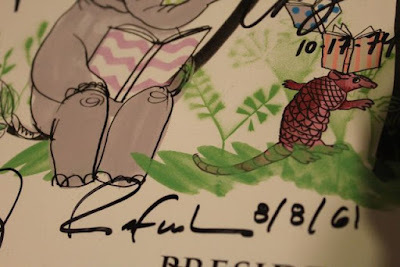 Rafael López shared his birthday with my family at the National Book Festival in 2013. Two years later, all the stars aligned for us to celebrate this amazing artist. What were the stars? First, Rafael came out with a new book, Drum Dream Girl: How One Girl's Courage Changed Music. Second, I bought Drum Dream Girl and Rafael autographed it for my children less than a month ago at the Mazza Museum Summer Conference. Third, my wife knew the perfect person to help us with our celebration and he agreed to help. 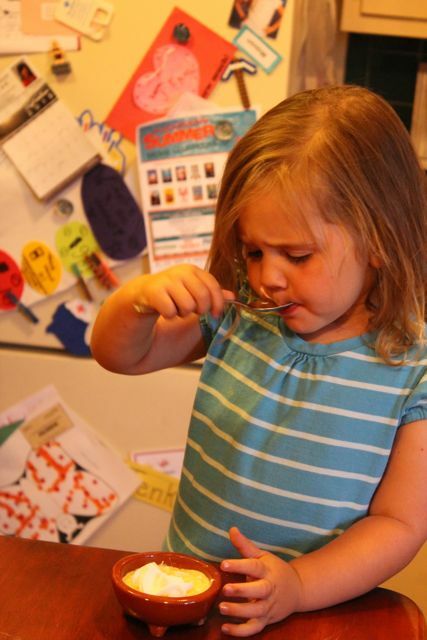 Plus, another book inspired a bonus activity for us to share with you. All of these things gave our family a very memorable reading experience this week. 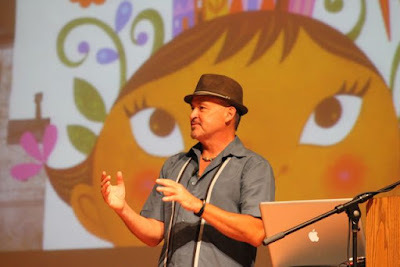 Rafael López is the illustrator of seven books for children including Yum! ¡Mmmm! ¡Qué Rico! America's Sproutings by Pat Mora and Tito Puente, Mambo King/Rey del Mambo by Monica Brown. He was born in Mexico City and grew up surrounded by bright colors. His parents, both architects, "instilled the love of Mexican culture" in him and taught him to love books, especially old art books. At the age of ten, his parents sent him to live in England with artist, Felipe Ehrenberg. This was an amazing experience for Rafael. 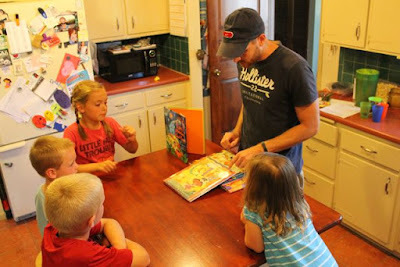 He made his first book; a journal where he recorded his experiences to share with his family upon his return to Mexico. (Mazza Museum Keynote). "I found myself immersed in a world of new hues, pale whites, grays and greens with vast open spaces. Visiting London was like a book that had come alive and each time I flipped the page it was thrilling." (Raphael López Studio Blog). Rafael López at the Mazza Museum Summer Conference 2015. 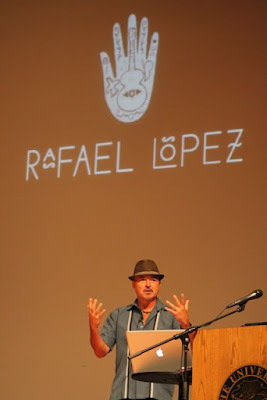 In 1982, Rafael graduated with a Fine Arts degree from Art Center College of Design in Los Angeles. After graduation he worked as an illustrator and later also as a muralist when he founded the Urban Art Trail Project in 1997. This project was dedicated to revitalizing urban areas through art and community involvement. Success continued for Rafael Lopez. In 2008, he created "Voz Unida," one of ten posters for President Obama's campaign by Artists for Obama. 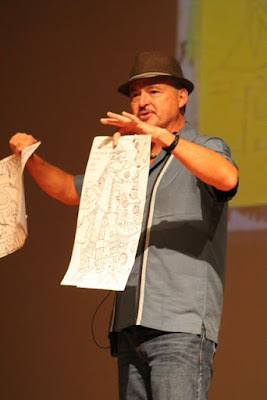 Then, in 2010, he was awarded the Pura Belpre Award for Illustration for Book Fiesta: Celebrate Children's Day/Book Day; Celebremos El dia de los ninos/El dia de los libros, written by Pat Mora. In 2012, he designed the poster for the National Book Festival and another for President Obama's reelection campaign, "Estamos Unidos". My oldest daughter noticed that his book publication is becoming more frequent with Tito Puente, Mambo King/Rey del Mambo, a 2014 Pura Belpre Honor Award Recipient, Drum Dream Girl in 2015, and the upcoming Maybe Something Beautiful: How Art Transformed a Neighborhood by F. Isabel Compoy and Theresa Howell in April 2016. We know Rafael's success will continue and we look forward to seeing Rafael's artwork in many children's books in the years to come! Artwork for Maybe Something Beautiful: How Art Transformed a Neighborhood is on the screen behind Rafael in this photograph. 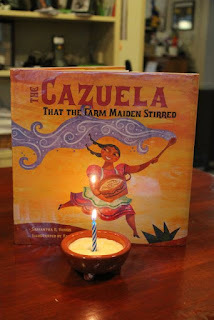 My family began our celebration for Rafael by reading The Cazuela That the Farm Maiden Stirred by Samantha R. Vamos, a 2012 Pura Belpre Honor Award Recipient. I discovered this book at the library and I loved it! The text pattern is much like The House that Jack Built, however spanish words words are introduced after the text is repeated. ("This is the pot that the farm maiden stirred. This is the butter that went into the cazuela that the farm maiden stirred.") 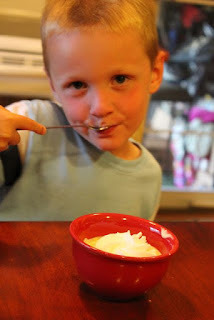 When, I reached the end of the book I found a recipe for rice pudding/arroz con leche. I didn't waste any time. I went to the grocery store right after the library to pick up the ingredients I needed to make this recipe with my family. 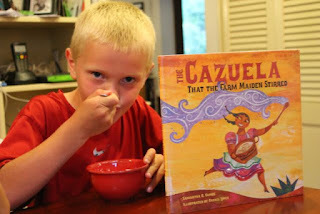 Before we read The Cazuela That the Farm Maiden Stirred, I told my children about the Pura Belpre Awards that Rafael received for his artwork. 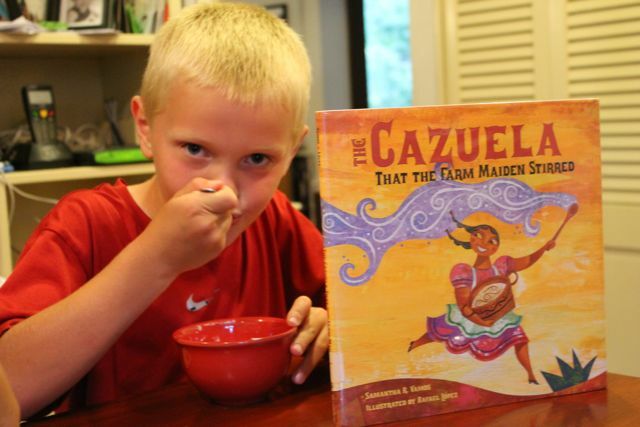 "This is the cazuela that we will stir." My oldest son took the lead on this cooking activity. 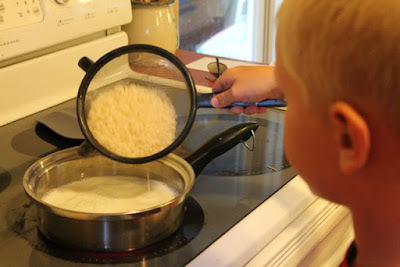 He rinsed the rice/arroz and added it to the milk/leche. My children had never seen cinnamon sticks before! 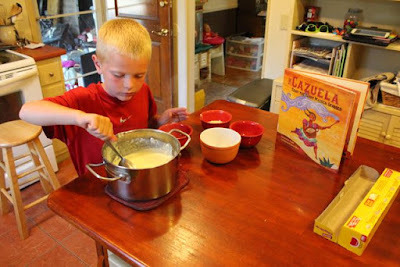 In one cazuela he had his milk and rice, and in the other he had cream/crema, butter/mantequilla, sugar/azúcar, lime/limón zest, and the cinnamon stick. Once the pudding thickened he scooped it into bowls for his siblings. 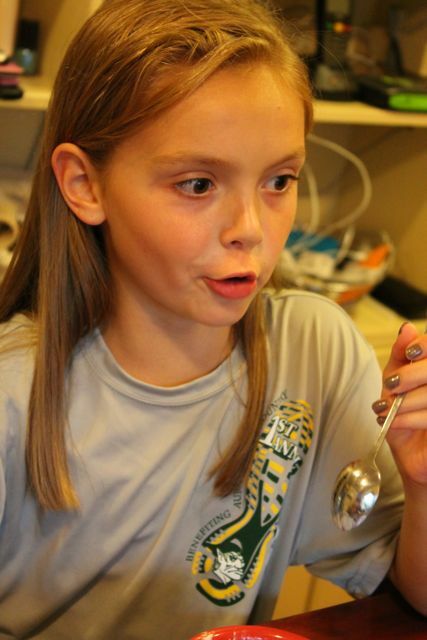 We let the rice pudding cool before serving. 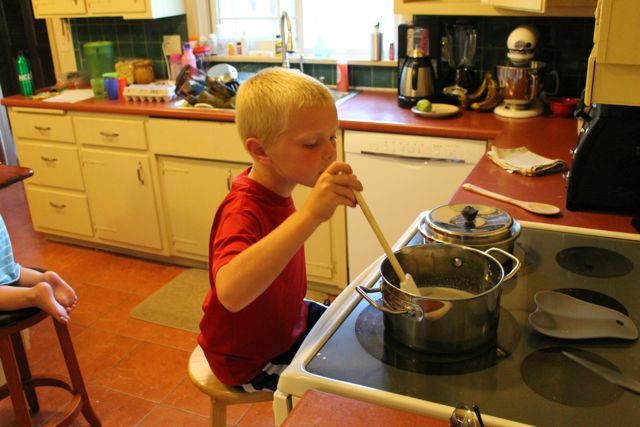 Nice job cooking, young man! Remember all the stars were aligned this week! We are only at the halfway point of our birthday celebration for Rafael López. 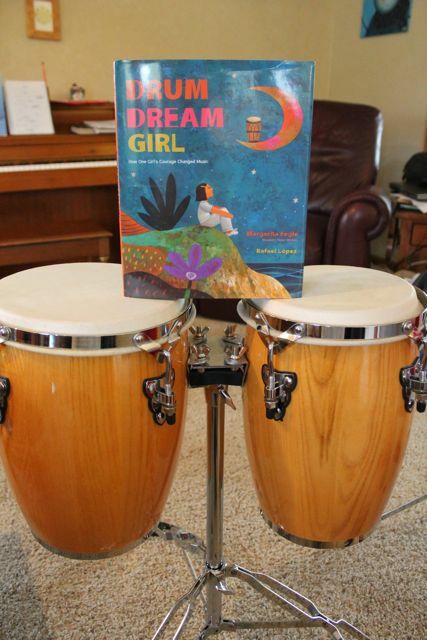 In March 2015, Rafael López released a new book Drum Dream Girl: How One Girl's Courage Changed Music, written by Margarita Engle. It is the story about Millo Castro Zaldarriaga as a young girl in Cuba during the 1930s when it was "believed that only boys should play drums." On the contrary, Millo was a drummer. She was a drummer because dreamed about drumbeats of congas and bongós and timbales. She was a drummer because she heard the rhythms of drumbeats everywhere, even in her own imagination. She was drummer because she played not only drums but also on tables and chairs. Millo was a drummer but she was told only boys were drummers. So she dreamed. 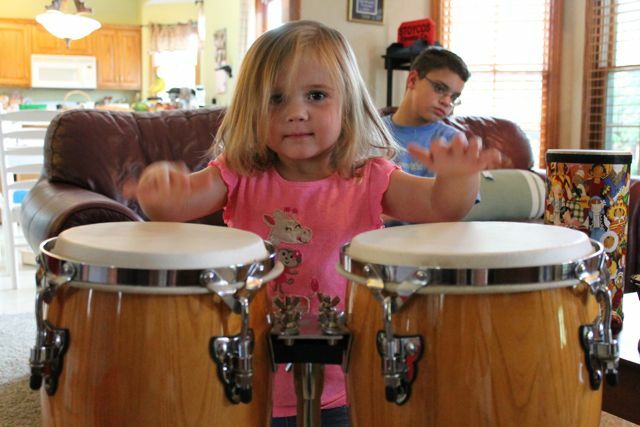 She dreamed until her big sisters, then her father, then a music teacher, and finally the world realized that girls can be drummers, too. Rafael López shared his process of illustrating Drum Dream Girl at the Mazza Museum Summer Conference 2015. He said the story reminded him of his mother, an architect who often confronted "girls cannot be architects." Rafael shared many sketches including this one of carnival dancers on stilts (my favorite illustration from the book). The carnival dancers are featured on a double-page spread that forces you to rotate the book to feel the height of the three masked-entertainers as they tower of Millo. Rafael traces his sketches onto wood which he has sanded by hand. He joked, The workers at Home Depot run and hide when they see me coming because I need 40 pieces of wood cut to size! He uses acrylic paint that he purchases in large jars when he is in Mexico. He works on a painting for no longer than three days otherwise he gets tired of it. (Mazza Museum Keynote). I absolutely LOVE Drum Dream Girl. I wanted to bring the book to life for my children. I asked my wife, "Do you know anybody at your school that has drums we can play? Maybe the music or orchestra teacher?" She said, "No, but I know just the person who knows a lot about drums." She was thinking of one of our former students. Our families are now very good friends and are nearly neighbors. My wife and I had him in first and second grade and now he is going into ninth grade!! 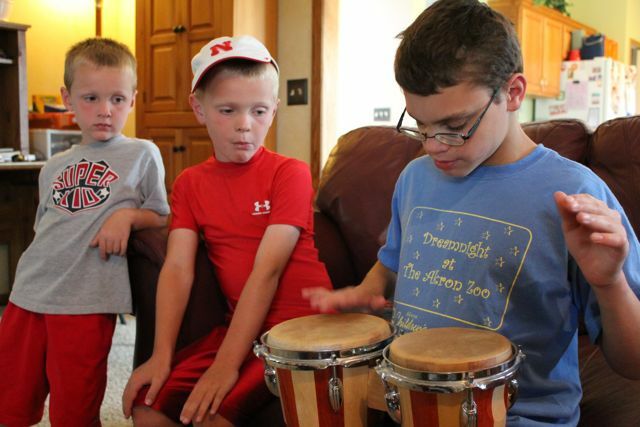 Thankfully, he agreed to have us over to his house to show us his drums. 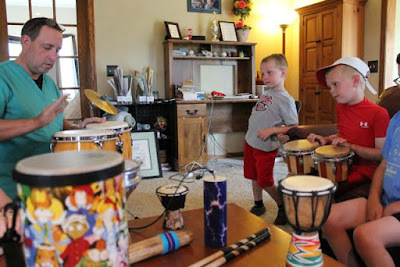 When we arrived at his house a variety of drums were arranged in the living room. I was blown away! 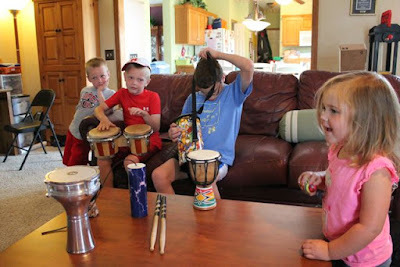 I thought my children might get to play the bongós and maybe the conga drums. 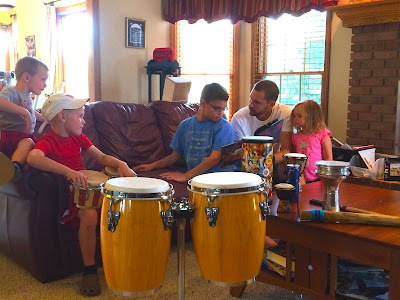 I never anticipated learning about so many different drums. In this photo, my oldest son plays the djembe which is an African drum. It was the drum that started his collection. We got a lesson on how to play the bongós. 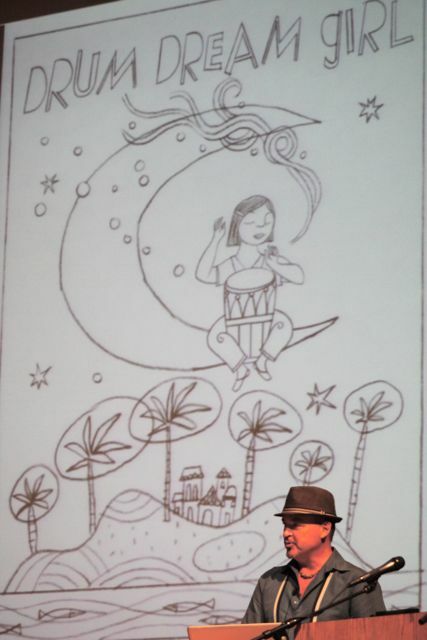 Millo plays the bongós in Drum Dream Girl. We learned there is a larger drum and a smaller drum in a pair of bongós. It was extra special to receive the drum lessons from our former student. 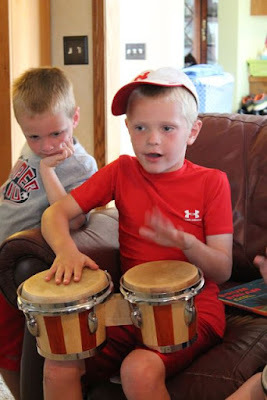 His love of drumming reminding me of Millo from Drum Dream Girl. 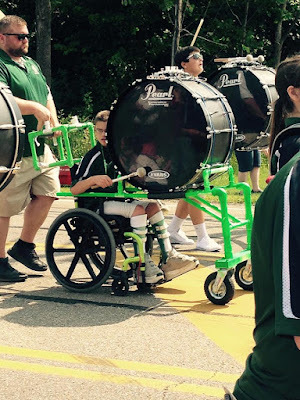 In our town's most recent Fourth of July Parade he played and marched with his bass drum as a part of the high school marching band. 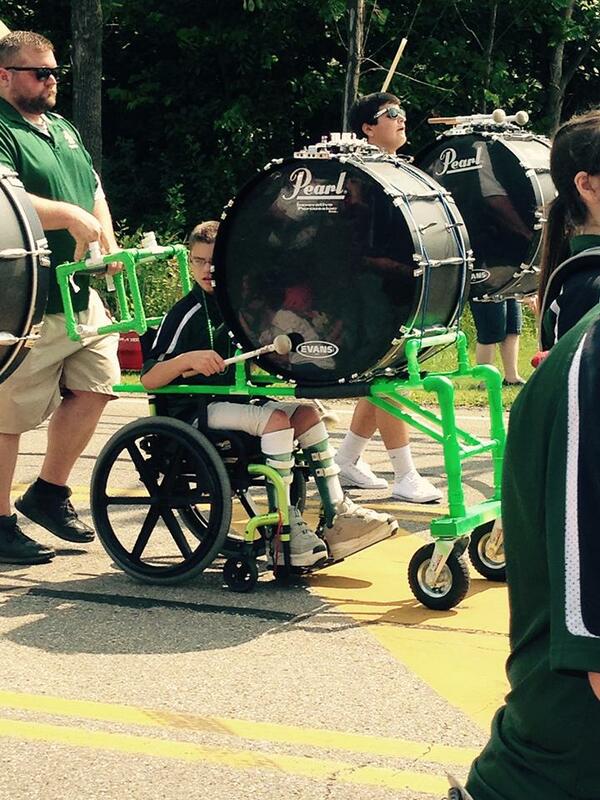 His father built him a customized apparatus out of PVC pipe to hold the large bass drum. I heard there is an aluminum version of this apparatus in the works! My son played the bongós as his shy brother looked on. 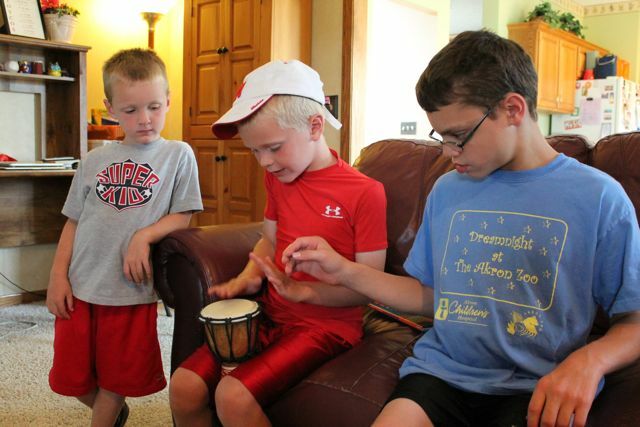 A few jam sessions broke out during our visit. Notice some of the other drums we learned about -- the silver one is a doumbek. 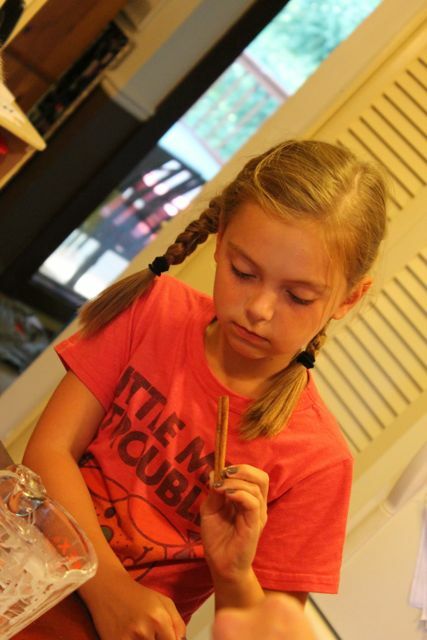 My daughter got the courage to play a shaker. Soon she moved on to the conga drums. She is my Drum Dream Girl. If she becomes a drummer we will look back at this day as the beginning of something special. We took a break from the music to read Drum Dream Girl. My former student asked, "Is this a book for little kids?" 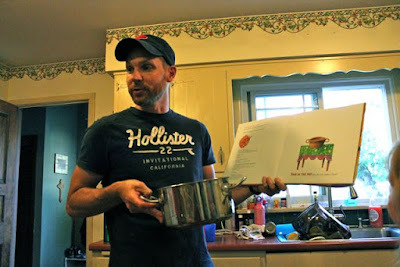 I said, "It is written with small children in mind, but can be enjoyed by older children and adults, too." He poured over the illustrations paying close attention to the drums. A huge THANK YOU to our former student for teaching us so much about drums! You helped make this a very special illustrator birthday celebration for our family. 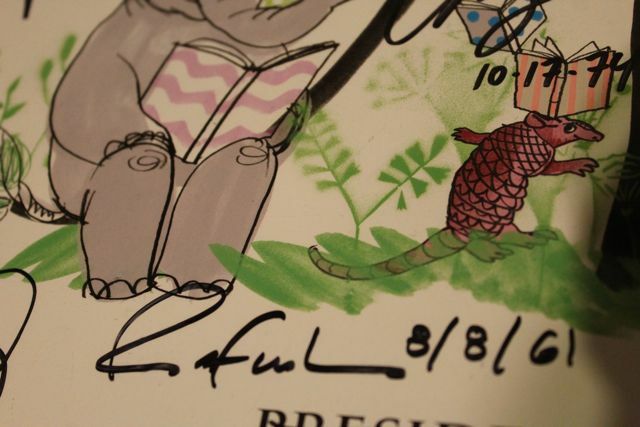 Rafael, thank you for sharing your birthday with us at the National Book Festival. I really enjoyed your presentation at the Mazza Museum, too! We hope you have a fantastic birthday! Enjoy your day! 5. Text Interviews - Seven Impossible Things Blog, Paper Tigers, Show and Tell, Bookjoy!